Although there has been a large degree of integration between European Union member states, foreign relations is still a largely intergovernmental matter, with the 28 members controlling their own relations to a large degree. However, with the Union holding more weight as a single bloc, there are at times[vague] attempts to speak with one voice, notably on trade and energy matters. The High Representative of the Union for Foreign Affairs and Security Policy personifies this role. The EU's foreign relations are dealt with either through the Common Foreign and Security Policy decided by the European Council, or the economic trade negotiations handled by the European Commission. The leading EU diplomat in both areas is the High Representative Federica Mogherini. The Council can issue negotiating directives (not to be confused with directives, which are legal acts) to the Commission giving parameters for trade negotiations. A limited amount of defence co-operation takes place within the Common Security and Defence Policy. However, it is hoped that defence co-operation and integration between member states will be improved by establishing a Military Planning and Conduct Capabilities (MPCC)" unit focused on military operations. The following countries host only a single Embassy of EU member state: Antigua and Barbuda (UK), Barbados (UK, EU delegation), Belize (UK, EU office), Central African Republic (France, EU delegation), Comoros (France), Gambia (UK, EU office), Guyana (UK, EU delegation), Lesotho (Ireland, EU delegation), Saint Vincent and the Grenadines (UK), San Marino (Italy), São Tomé and Príncipe (Portugal), Solomon Islands (UK), Timor-Leste (Portugal, EU delegation), Vanuatu (France, EU delegation). The European Commission also has no delegations or offices to most of them (exceptions mentioned in brackets). Trade between the EU and Israel is conducted on the basis of the Association Agreement. The European Union is Israel's major trading partner. In 2004 the total volume of bilateral trade (excluding diamonds) came to over €15 billion. 33% of Israel's exports went to the EU and almost 40% of its imports came from the EU. Prior to the 2011 Libyan civil war, the EU and Libya were negotiating a cooperation agreement which has now been frozen. The EU worked to apply sanctions over the Libyan conflict, provide aid and some members participated in military action. In 2017, Federica Mogherini, the foreign minister of the European Union stirred controversy and diplomatic confusion over her statement that the trade agreements between Morocco and the EU would not be affected by the 2016 ruling by the European Court of Justice on the scope of trade with Morocco. This ruling confirmed that bilateral trade deals, such as the EU–Morocco Fisheries Partnership Agreement, covers only agricultural produce and fishing products originating within the internationally recognized borders of Morocco, thus explicitly excluding any product sourced from Western Sahara or its territorial waters. The international community, including the EU, unanimously rejects Morocco's territorial claim to Western Sahara. The European Union relations and cooperation with Barbados are carried out both on a bilateral and a Caribbean-regional basis. Barbados is party to the Cotonou Agreement, through which As of December 2007[update] it is linked by an Economic Partnership Agreement with the European Commission. The pact involves the Caribbean Forum (CARIFORUM) subgroup of the African, Caribbean and Pacific Group of States (ACP). CARIFORUM is the only part of the wider ACP-bloc that has concluded the full regional trade-pact with the European Union. There are also ongoing EU-Community of Latin American and Caribbean States (CELAC) and EU-CARIFORUM dialogues. The Mission of Barbados to the European Union is located in Brussels, while the Delegation of the European Union to Barbados and its regional neighbors is in Bridgetown. Both the United States and the European Union as of 2005[update] have an arms embargo against China (PRC), put in place in 1989 after the events of Tiananmen Square. The U.S. and some EU members continue to support the ban but others, spearheaded by France, have been attempting to persuade the EU to lift the ban, arguing that more effective measures can be imposed, but also to improve trade relations between China and certain EU states. The U.S. strongly opposes this, and after the PRC passed an anti-secession law against Taiwan the likelihood of the ban being lifted diminished somewhat. The EU is China's largest trading partner, and China is the EU's second largest trading partner. Most of this trade is in industrial and manufactured goods. Between 2009 and 2010 alone EU exports to China increased by 38% and China's exports to the EU increased by 31%. However, there are sources of tension, such as human rights and the EU's arms embargo on China. Both the United States and the European Union as of 2005[update] have an arms embargo against the PRC, put in place in 1989 after the events of Tiananmen Square. The US and some EU members continue to support the ban but others, spearheaded by France, have been attempting to persuade the EU to lift the ban, arguing that more effective measures can be imposed, but also to improve trade relations between the PRC and certain EU states. The US strongly opposes this, and after the PRC passed an anti-secession law against Taiwan the likelihood of the ban being lifted diminished somewhat. The EU and Hong Kong share values of democracy, human rights and market economics. Hong Kong Economic and Trade Office, Brussels is the official representation of Hong Kong to the European Union. New Zealand and the European Union (EU) have strong historical and cultural ties. The two have solid relations and often see eye-to-eye on international issues. The EU-New Zealand relations are founded on a Joint Declaration on Relations and Cooperation, first agreed in 2007. It covers not just economic relations, but broader political issues and cooperation. The EU is New Zealand's second largest trading partner, after Australia, and New Zealand is the EU's 49th. New Zealand's exports is dominated by agricultural goods. The stock of EU foreign direct investment in New Zealand is €9.8bn and the stock of New Zealand's investment in the EU is €4.5bn. Further Information: Foreign relations of South Korea#Europe. An update to the 10 year old EU-Central Asia strategy is expected to be developed by the end of 2019. The EU launched in 2002 the BOMCA to mitigate the impacts of human trafficking, trafficking of drugs, organised crime and terrorism on EU interests and regional partners. The CADAP works to bolster drug policies of Central Asian states by providing assistance policy makers, industry experts, law enforcement, educators and medical staff, victims of drug abuse, the media and the general public. The Partnership and Cooperation Agreement (PCA) (signed in 1996 and in force since 1999) serves as the legal framework for EU-Armenia bilateral relations. Since 2004, Armenia and the other South Caucasus states have been part of the European Neighbourhood Policy, encouraging closer ties between Armenia and the EU. Armenia and the EU were set to sign an Association Agreement in early September 2013, however the agreement was called off by Armenia, prior to Armenia joining the Eurasian Union in 2014. Though, a revised Comprehensive and Enhanced Partnership Agreement was later finalized between Armenia and the EU in February 2017. Armenia further participates in the Eastern Partnership Program and the Euronest Parliamentary Assembly which aims at forging closer political and economic ties with the EU. In April 2018, Armenia began implementing actions for launching dialogue over visa liberalization for Armenian citizens travelling into the Schengen area. The European Union has the Enhanced Strategic Partnership and Cooperation Agreement with Kazakhstan, its first with a Central Asian country. The EU is also the largest foreign investor in Kazakhstan, representing over 50% of Foreign Direct Investment (FDI) in Kazakhstan. EU regional initivatives; current enlargement agenda (SAP and candidate countries), ENP; Eastern Partnership, Euromediterranean Partnership and EU-Russia Common Spaces. ^ TFEU Article 218(2); see Wathelet, Melchior. "ECLI:EU:C:2015:174 European Commission v Council of the European Union". Retrieved 22 June 2018. ^ Barigazzi, Jacopo. "EU's small steps toward (whisper it) a military HQ". Politico.eu. Retrieved 3 March 2017. ^ "EU commission 'embassies' granted new powers". euobserver.com. Retrieved 3 April 2018. ^ "European Commission Delegations: Interaction with Member State Embassies". 8 December 2008. Archived from the original on 8 December 2008. Retrieved 3 April 2018. ^ a b "Local offices in EU member countries". European Commission - European Commission. Retrieved 3 April 2018. ^ "Joint consular work to reinforce 'EU citizenship'". euobserver.com. Retrieved 3 April 2018. ^ a b "Iran - Trade - European Commission". ec.europa.eu. Retrieved 3 April 2018. ^ "The Middle East Peace Process". European Union. Archived from the original on 20 January 2008. Retrieved 2008-02-09. ^ "EU court strikes blow against Israeli settlers". euobserver.com. Retrieved 3 April 2018. ^ Sadaka. "The EU and Israel" (PDF). p. 1. Retrieved 30 August 2011. ^ a b Allen, D. and Pijpers, A. (1984), p 44. ^ Irish Aid (17 December 2007). "Minister Kitt pledges additional assistance for Palestinians at Paris Donor Conference". Government of Ireland. Retrieved 2 August 2011. ^ Agence France-Presse (17 November 2009). "Too early to recognize Palestinian state: Bildt". The Local. Archived from the original on 11 November 2011. Retrieved 2011-08-01. ^ Office of the European Union Representative West Bank and Gaza Strip. "The Role of the Office of the European Union Representative". European Union. Retrieved 4 September 2011. ^ Permanent Observer Mission of Palestine to the United Nations. "Palestine Embassies, Missions, Delegations Abroad". Palestine Liberation Organisation. Archived from the original on 25 February 2011. Retrieved 4 September 2011. ^ Allen, D.; Pijpers, A. (1984). European foreign policy-making and the Arab-Israeli conflict. Martinus Nijhoff Publishers. p. 69. ISBN 978-90-247-2965-4. ^ Katz, J.E. "The Palestine Liberation Organization (PLO)". EretzYisroel. Retrieved 4 September 2011. ^ "In Cairo speech, EU's Catherine Ashton very critical of Israeli policies". Archived from the original on 24 February 2012. Retrieved 12 January 2013. ^ McCarthy, Rory (1 December 2009). "East Jerusalem should be Palestinian capital, says EU draft paper". the Guardian. Retrieved 3 April 2018. ^ Agence France-Presse (13 July 2009). "Israel rejects EU call for Palestinian state deadline". Hurriyet Daily News. Hurriyet Gazetecilik A.S. Retrieved 1 August 2011. ^ Agence France-Presse (28 August 2011). "Palestinians see progress in EU stance on UN bid". France 24. Archived from the original on 29 August 2011. Retrieved 2011-08-01. ^ Keinon, Herb (28 August 2011). "Israel looks to influence text of PA statehood resolution". The Jerusalem Post. Retrieved 1 September 2011. ^ Editorial, Reuters. "EU to uphold Morocco farm accord despite Western Sahara ruling". reuters.com. Retrieved 3 April 2018. ^ "Morocco deals don't cover Western Sahara, EU lawyer says". euobserver.com. Retrieved 3 April 2018. ^ "The EU's Morocco problem". politico.eu. 23 December 2016. Retrieved 3 April 2018. ^ Dudley, Dominic. "European Court Dismisses Morocco's Claim To Western Sahara, Throwing EU Trade Deal Into Doubt". forbes.com. Retrieved 3 April 2018. ^ "European Union – EEAS (European External Action Service) | EU Relations with Barbados". Europa (web portal). 19 June 2014. Retrieved 10 November 2018. ^ "EU-US Facts & Figures". European Union External Action. Retrieved 7 July 2011. ^ "The European Union and the United States: Global Partners, Global Responsibilities' " (PDF). Delegation of the European Union to the United States. Archived from the original (PDF) on 5 January 2012. Retrieved 5 January 2012. ^ Hong Kong Economic and Trade Office, Brussels Official Website, retrieved 14/10/2016. ^ "Malaysia-European Union Bilateral Relations". Ministry of Foreign Affairs, Malaysia. Archived from the original on 5 May 2014. Retrieved 5 May 2014. ^ a b Christoph Marcinkowski; Ruhanas Harun; Constance Chevallier-Govers. "Malaysia and the European Union: A Partnership for the 21st Century". Centre D'Etudes Sur La Securite Internationale Et Les Cooperations Europeennes. Retrieved 5 May 2014. ^ "Malaysia". European External Action Service. Archived from the original on 5 May 2014. Retrieved 5 May 2014. ^ "Malaysia-European Union Free Trade Agreement (MEUFTA)". Ministry of International Trade and Industry, Malaysia. 18 April 2014. Archived from the original on 5 May 2014. Retrieved 5 May 2014. ^ "Pakistan - Trade - European Commission". ec.europa.eu. Retrieved 3 April 2018. ^ a b "European Commission - South Korea Briefing". European Commission. Retrieved 11 January 2009. ^ "FRAMEWORK AGREEMENT for Trade and Cooperation between the European Community and its Member States, on the one hand, and the Republic of Korea, on the other hand" (PDF). European Commission. 30 March 2001. Retrieved 13 January 2009. ^ a b "The EU and the countries of Central Asia held their High-level Political and Security Dialogue in Ashgabat on 9 July 2018". EU External Action. ^ "Central Asia, EU discuss cooperation, new strategy". Astana Calling. ^ "BOMCA". Border Management Programme in Central Asia. ^ "CADAP". Central Asia Drug Action Programme. ^ "EU, Armenia Finalize New Deal on Closer Ties". Asbarez News Agency. Retrieved 12 October 2018. ^ "Armenia hopeful to receive visa liberalization program from EU soon". Armenpress. Retrieved 12 October 2018. ^ "European Parliament ratifies Enhanced Partnership and Cooperation Agreement (PCA) partnership with Kazakhstan". www.eureporter.co. ^ Ordine di Malta. "Multilateral relations". Retrieved 20 February 2015. ^ "EU and the G8". European Commission. Archived from the original on 26 February 2007. Retrieved 2007-09-25. ^ Junker, Jean-Claude (2006). 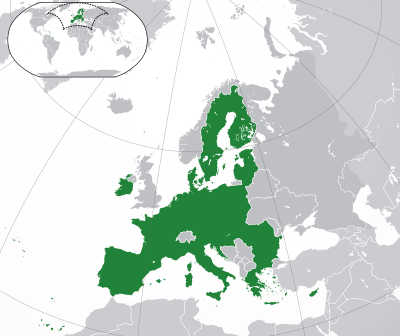 "Council of Europe - European Union: "A sole ambition for the European continent"" (PDF). Council of Europe. Retrieved 28 July 2007. ^ "Draft treaty modifying the treaty on the European Union and the treaty establishing the European community" (PDF). Open Europe. 24 July 2007. Archived from the original (PDF) on 8 August 2007. Retrieved 28 July 2007.